Before drafting a pitch deck, raising financing, or thinking about scaling a business, it's critical to understand the difference between a market and a customer. Differentiating markets and customers is where I begin my class lectures each semester and where I will begin this post. Customers and markets are often confused. Additionally, general markets and the actual target market of interest are often further confused. A lot of "green" entrepreneurs highlight market figures of billions of dollars. For example, I might hear, "As a cutting edge off road tire company we are entering the approximately $200 billion dollar auto parts market." What they fail to identify is that their target market is actually a segment of the auto parts market that represents about $400M in annual sales. Investors are not stupid (generally). This type of market analysis leaves investors feeling like the entrepreneur does not really understand their product or service. When analyzing markets I like to start large and end small (tire market -> off road tire market). Sticking with our auto tire example, the largest market segment is considered our Total Available Market or TAM. The TAM includes the total number of auto tires sold each year. We know this figure is likely larger than the sales we could actually achieve with our off road specific tire, ie, not every tire sold is an off road tire. From the TAM we determine the number of off road tires that are sold annually. This is our Served or Serviceable Available Market (SAM). The SAM is a segment or portion of the TAM. The next step is to think about what percentage of the SAM could be converted into customers (people who buy our product). This segment is known as the Serviceable Obtainable Market or SOM. Understanding how TAM > SAM > SOM will not only help you understand your market, but will also help you with financial forecasts, inventory forecasts, and growth strategy. 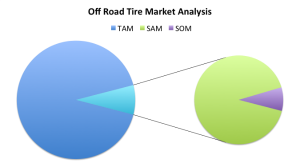 The pie chart illustrates how the off road tire market is only a portion of the TAM. The SAM (green) is the real market segment of interest, and the SOM (purple) is the market share we hope to take in sales over some duration of time. Another mistake I see over and over is confusing market figures with sales figures. Markets do not purchase products or services, customers do. A market is nothing more than a group with the desire and ability to purchase a product or service. Within a given market segment it is important to understand that not everyone will want to buy your product or service and that this is ok. What is most important is understanding why certain people will and will not buy your product or service. This is knowing your customer - the individual or business that actually pays for your product or service.